At an early age the late John Tyler worked for his father, a founder of several insurance companies. This experience led John Tyler to follow in his father’s footsteps and in 1928, he founded Farmers Insurance Group. Under John Tyler’s leadership as Chief Executive Officer, and later as Chairman, the company overcame the Great Depression and grew to rank among the leaders in the field. John and Alice Tyler appreciated nature and enjoyed its closeness through ranching, sailing, and all forms of outdoor life. They were concerned about the increasing ravages of pollution, and resolved to help conserve what is natural and beautiful in our world by establishing this international award. In addition to her foremost concerns, world environment and education, the late Alice Tyler’s interests also extended to child health, medical research, and the arts as a co-founder of ARCS (Achievement Rewards for College Scientists). 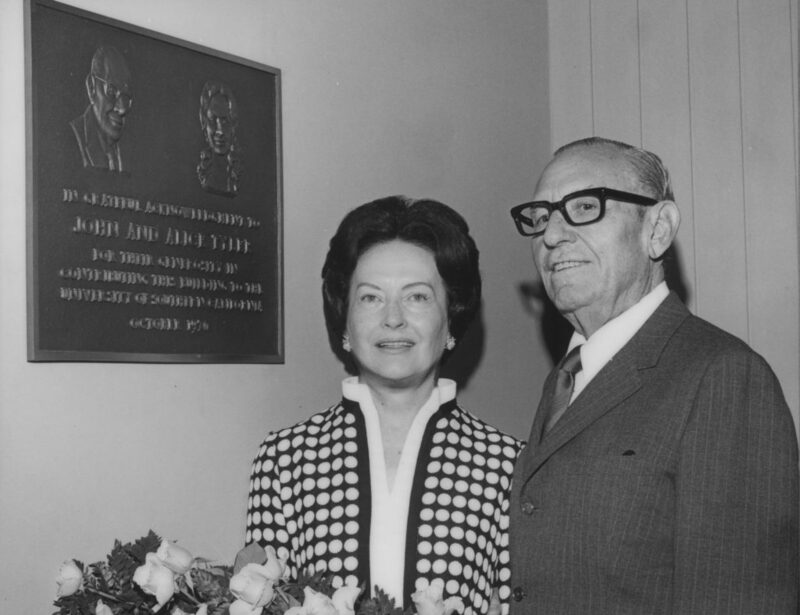 Mrs. Tyler was a supporter of medical research at the University of California and contributed building funds to local hospitals. She especially embraced Childhelp U.S.A. for its dedication to and care of abused children. Mrs. Tyler was also a Dame of the Danish Order of St. John. A constant in Alice and John Tyler’s lives was their affection for animals; to continue this bond, Mrs. Tyler adopted a variety of endangered wildlife and provided for their exhibition at the Los Angeles Zoo. She put together a large art collection, some of which focused on peace and the environment. The Tylers were also founding members of the Los Angeles Music Center Building Fund, provided buildings to the University of Southern California and Pepperdine University.